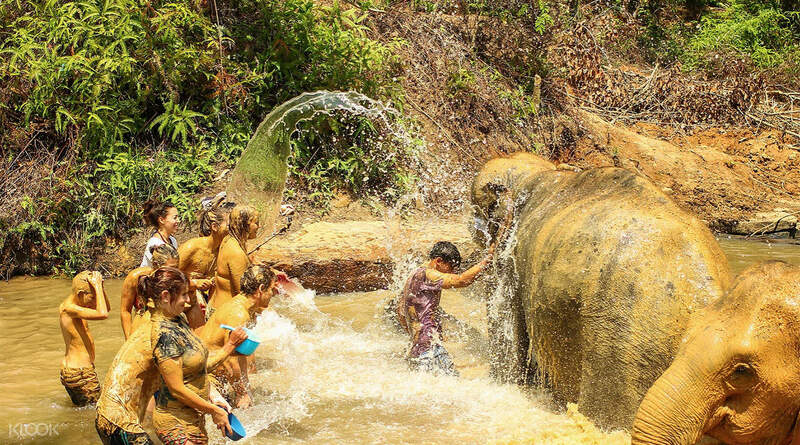 Enjoy a mud spa with the elephants, and even help bathe them! That activity was amazing. Including the pick up and drop off from your stay. They also provided the lunch with local food. It was so nice. Also, have the guys they took the photo for you. I am highly recommended to my friend to join. 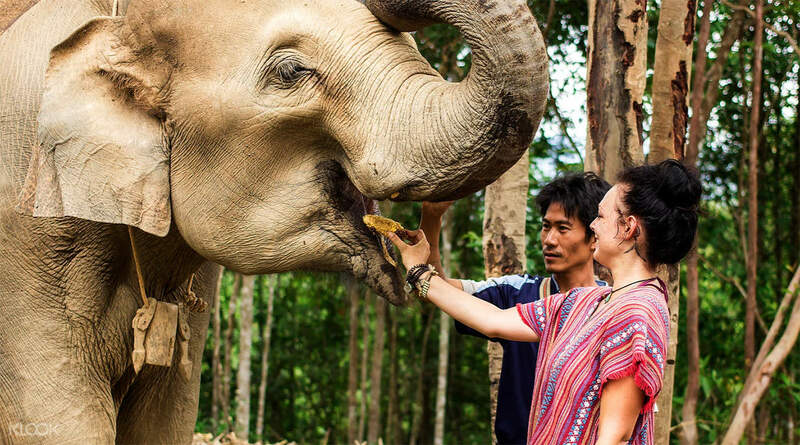 A truly wholesome, immersive experience with Thailand's famous gentle giants is only possible on an ethical elephant experience with great consideration for the welfare of the animal. This is why a half day trip to the famous Elephant Jungle Sanctuary in Phuket has become so popular: visitors will be able to interact and join the elephants in their natural habitat and learn about the life of these rescued giants. After a briefing on the work and background of the sanctuary as well as some snacks, visitors will be able to don the traditional clothing of the Karen tribe. They will help the sanctuary's keepers to prepare natural dietary supplements for the elephants in their care. Then they will be properly introduced to the sanctuary's rescue elephants, and even feed them the prepared supplements. While playing and interacting with the elephants, taking photos and making sure they are well fed, or even just observing them, visitors will be able to learn about the elephants' past. They'll be taught about elephant behavior patterns and characteristics, and bond better with them when they learn how a truly ethical experience with elephants is achieved. Visitors will also get the chance to have some good clean fun by taking a big mud spa with the elephants, and help them wash off afterwards in the elephant shower room! Then you'll get your own shower and enjoy a delicious Thai meal as a reward for all the hard work, with vegetarian options available. You'll be dropped off back to your hotel a true sense of accomplishment, knowing that you've aided the sanctuary and its elephants, and learnt how to best help these beautiful creatures in the future. Get dirty in a mud spa with the elephants! It was a lovely morning. What a great way to encounter these beautiful friendly giants. Lunch was delicious and the staff were friendly. Great touch was the photos that were available for download on Facebook and the Karen T-Shirt gifted at the end. Would highly recommend. It was a lovely morning. What a great way to encounter these beautiful friendly giants. Lunch was delicious and the staff were friendly. Great touch was the photos that were available for download on Facebook and the Karen T-Shirt gifted at the end. Would highly recommend. great experience. nice to see the elephants are treated well here at the sanctuary. staff is very informative. there was time for preparing food for elephants, elephant health check, mud bath and washing elephant. we also got a short thai cooking class. food was good too! great experience. nice to see the elephants are treated well here at the sanctuary. staff is very informative. there was time for preparing food for elephants, elephant health check, mud bath and washing elephant. we also got a short thai cooking class. food was good too! STRONGLY RECOMMEND this activity as it is so educational. We fed the elephants and helped them to take showers. It made us muddy, but this was so enjoyable that I would join this activity again when I visited Chiangmai and Pattaya next time - there were also elephant sanctuaries in these two cities by this organisation. STRONGLY RECOMMEND this activity as it is so educational. We fed the elephants and helped them to take showers. It made us muddy, but this was so enjoyable that I would join this activity again when I visited Chiangmai and Pattaya next time - there were also elephant sanctuaries in these two cities by this organisation. A wonderful experience. We had a great time feeding and bathing the elephants. Well worth it. The guides were very good and funny. Even the buffet lunch was delicious. A must do when you're in Thailand. A wonderful experience. We had a great time feeding and bathing the elephants. Well worth it. The guides were very good and funny. Even the buffet lunch was delicious. A must do when you're in Thailand. Absolutely amazing morning. These elephants are SO loved and cared for and the experience is once in a lifetime. Smooth timely transfers from my hotel, great talk on elephants, really good feeding session, mud bath is amazing and bathing the elephants is so much fun. There is also a photographer whom is really attentive so no need to worry about getting your own photos (although this is possible during feeding!). The people that run this sanctuary are doing an amazing job! 10 stars! Absolutely amazing morning. These elephants are SO loved and cared for and the experience is once in a lifetime. Smooth timely transfers from my hotel, great talk on elephants, really good feeding session, mud bath is amazing and bathing the elephants is so much fun. There is also a photographer whom is really attentive so no need to worry about getting your own photos (although this is possible during feeding!). The people that run this sanctuary are doing an amazing job! 10 stars! The pick up from the hotel went smooth, about an hour or so drive after that. Then, you get to ride this pick-up truck on a VERY bumpy road to take you to the sanctuary. You get to interact with the gentle giants by petting, feeding and bathing them. After the events, you get a free late lunch which was good and had vegetarian options. Also got a free shirt from the sanctuary. I also appreciated how there was a photography to document the whole thing so that I don’t have to worry about taking photos for memories, you can get the photos via fb later on, YAAAAS! Overall, it was truly a heart warming experience and definitely a highlight of my trip to Phuket. The pick up from the hotel went smooth, about an hour or so drive after that. Then, you get to ride this pick-up truck on a VERY bumpy road to take you to the sanctuary. 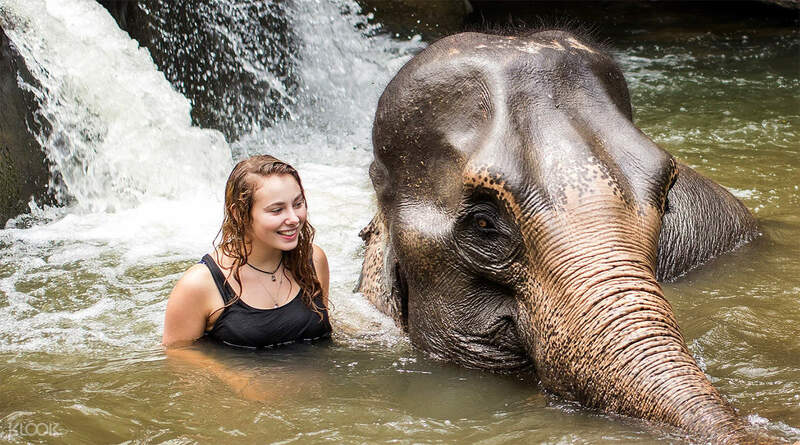 You get to interact with the gentle giants by petting, feeding and bathing them. After the events, you get a free late lunch which was good and had vegetarian options. Also got a free shirt from the sanctuary. I also appreciated how there was a photography to document the whole thing so that I don’t have to worry about taking photos for memories, you can get the photos via fb later on, YAAAAS! Overall, it was truly a heart warming experience and definitely a highlight of my trip to Phuket. Activity was fun, but unfortunately it is raining on the day we visit, yet the programme still going as they are having another session to visit in the afternoon. The hotel transfer is by a small tuk tuk, as the road conditions is bad, thus no van is suitable to enter the area. The elephant is cute and even know how to interact with us. Although it is slightly expensive but yet it is still a very good experience. Activity was fun, but unfortunately it is raining on the day we visit, yet the programme still going as they are having another session to visit in the afternoon. The hotel transfer is by a small tuk tuk, as the road conditions is bad, thus no van is suitable to enter the area. The elephant is cute and even know how to interact with us. Although it is slightly expensive but yet it is still a very good experience. The most amazing experience! Transfer was in an open air car and a little dangerous but the sanctuary was great. The guides were funny and the elephants seem genuinely happy there! The most amazing experience! Transfer was in an open air car and a little dangerous but the sanctuary was great. The guides were funny and the elephants seem genuinely happy there!